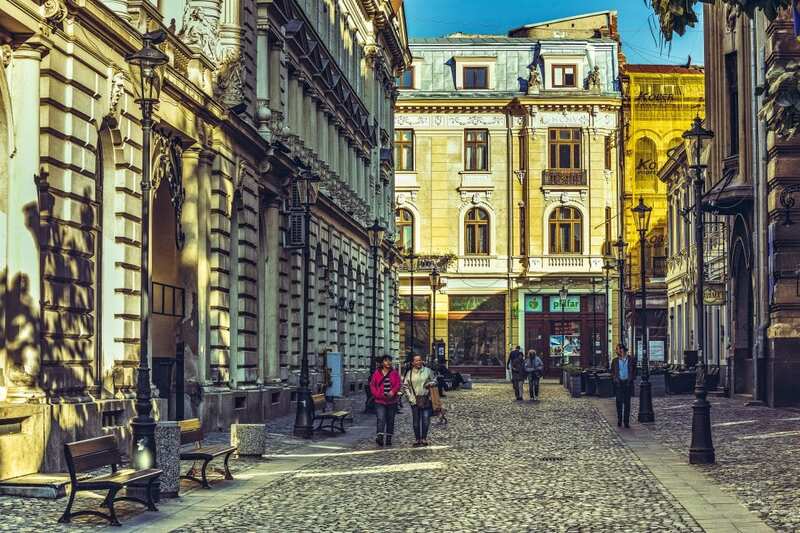 Vibrant and atmospheric, Bucharest is also a very budget friendly travel destination. Probably about the same as we did before we came here, which is to say… very little. Chances are you’ve heard of Vlad the Impaler (and know that Bram Stoker’s The Legend of Dracula was based on him), know that the capital of Romania is Bucharest, and have heard of the region called Transylvania, but probably not much more. Bucharest’s relatively esoteric status is unfortunate since we found it to be a welcoming city full of unexpected charm. 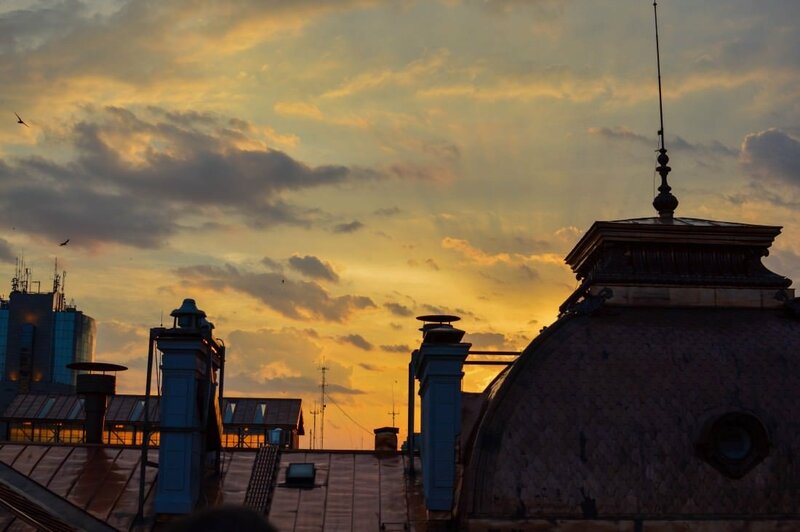 After spending seven weeks living in the city once dubbed “The Little Paris” we developed a deep appreciation for Bucharest, its architecture, its ambiance, its nightlife, and most of all, its people. And, we found that traveling to Bucharest on a budget to be pretty damn easy. Romania’s national currency is called the Romanian New Leu, which is referred to as either RON or Lei. At the time of publication $1.00 USD was roughly equivalent to 4 RON. During our seven week stay in Bucharest, we spent an average of $30.00 USD per day. 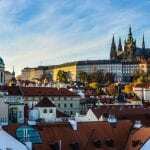 It’s quite possible to spend much less than that, if you care to pinch your pennies even further and stay in a hostel (we rented an apartment), making a visit to Bucharest Romania on a budget extremely easy. 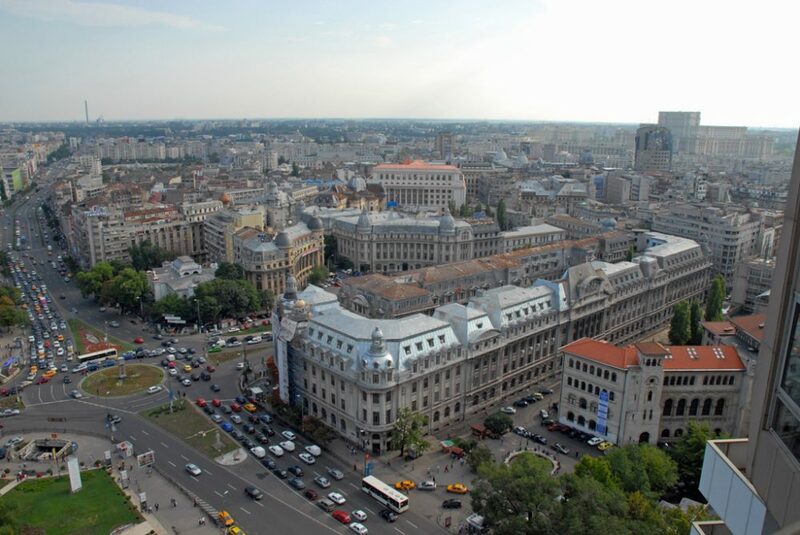 Bucharest has every sort of accommodation option you can expect from a capital city. 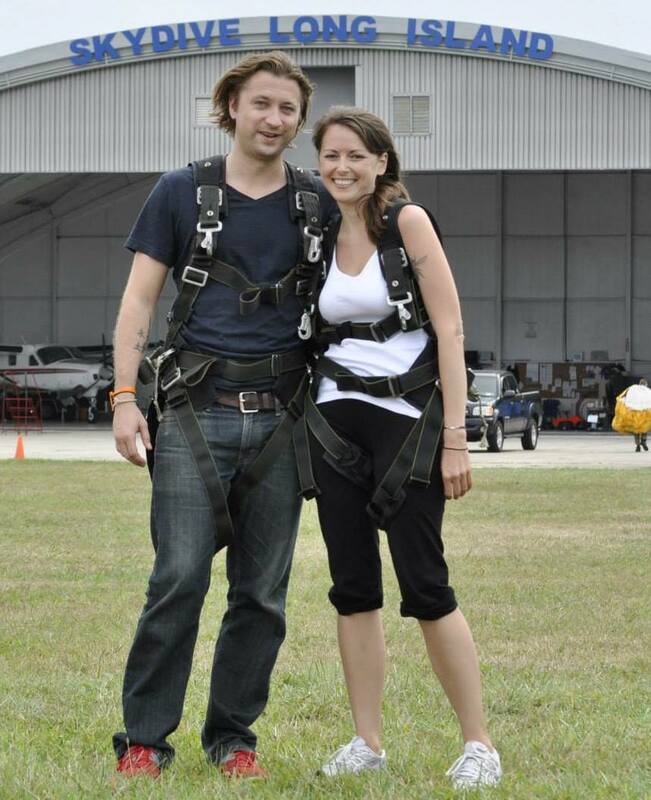 If you are the type to forgo swanky hotel stays, there are plenty of lower budget options. The city is host to some great hostels, affordable hotels, and reasonably priced AirBnB rentals. 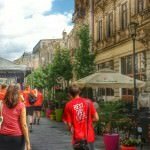 For backpackers in Romania we prepared a list of some of the best hostels in Bucharest, to make your search for a great hostel easier. 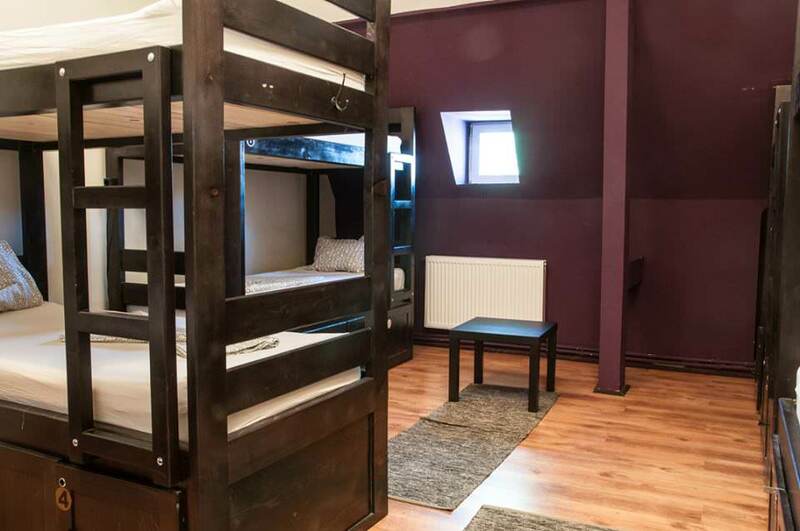 Book-A-Rest Hostel opened in July 2015 and has the cheapest dorm beds in all of Bucharest at about $5.50 a night and private rooms that start at $28.00 a night. Don’t be suspicious of the price tag. This hostel is smartly designed, has super comfy beds, private bathrooms for each room, and plenty of communal space to meet other travelers. It’s also located in a beautiful neighborhood that’s about a 15 minute walk from University Plaza and Old Town. As a bonus the hostel is located right next to a really cool bar/restaurant called The Jar Bar. We lived a few streets away from the Jar and had many a Ciuc draft there (for a thrifty $1.50 a beer). Double bonus, the Teatrul de Artă Theater is ALSO located right next door. That means you can stay for cheap, have a cold beer, and take some culture in. We highly recommend staying at Book-a-Rest, as it is one of the very best hostels in Bucharest. Location is Pura Vida’s greatest asset, as it is located right in the middle of the Old Town, and is within walking distance of some of Bucharest’s best bars, restaurants, and attractions. The skybar is a great place to hang out in the evening on a warm day, but there are options all around the hostel. The hostel itself is clean, with comfortable dorms and bunks. We wish they didn’t make you pay for a towel, but hey, can’t have it all. Antique is super clean, sports a friendly staff, and is located right on the edge of Old Town. The hostel’s staff helps create a relaxed and comfortable atmosphere, making each visitor feel welcome. The Friday Night Pub Crawl is a good option if you want to have an epic night out with other travelers. 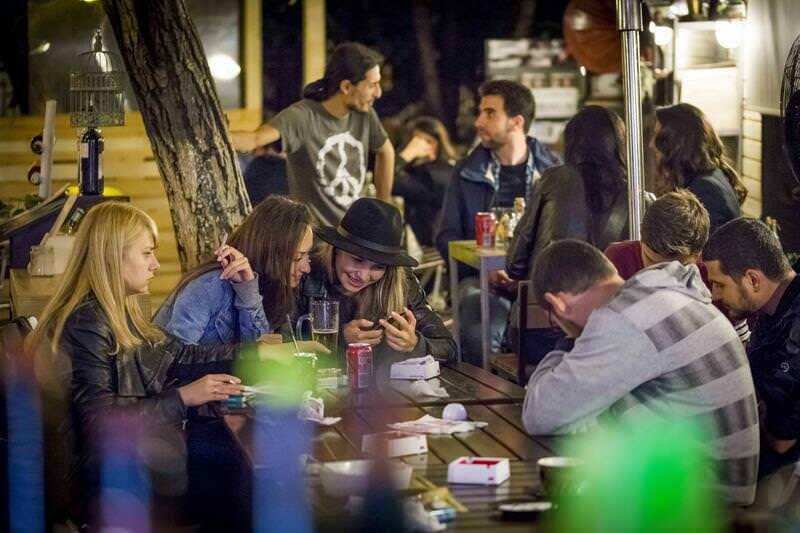 Throw in a huge (and well equipped) kitchen, an outdoor garden, a BBQ grill, and blazing fast Wi-Fi and you have a recipe for one of the best hostels in Bucharest. Bucharest has plenty of hotels to choose from, including everything from luxury, five star establishments, and boutique hotels. A three star hotel in central Bucharest starts at $35.00 a night and a five star hotel starts at $150 a night. We can recommend the centrally located Radisson Blu Hotel. Click here to book a room on Booking.com. Since we planned on staying in Bucharest for a minimum of a month renting an apartment was the only option that made sense. Luckily, a fellow blogger put us in contact with a local friend that helped us find an apartment in a fantastic, centrally located neighborhood that ended up costing us about $19.00 per night total ($9.50 pp). That said, there are plenty of even cheaper options. An apartment in Bucharest will typically run you approximately $300 – $650 a month and will usually include the cost of utilities. PRO TIP: A great way to find apartments to rent is through Expat Groups on Facebook and Couchsurfing meetups. 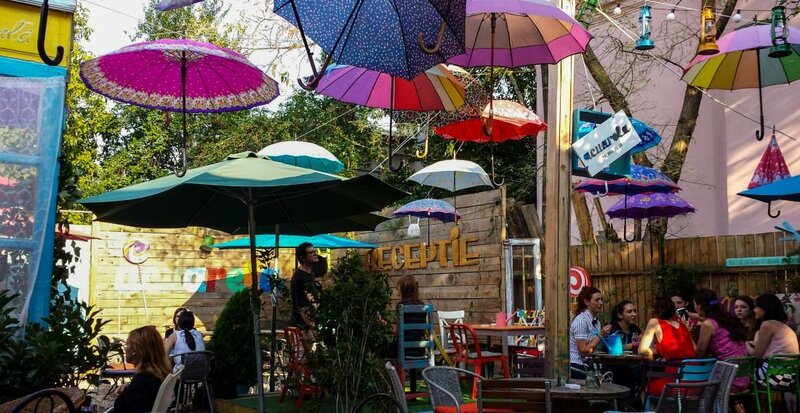 Bucharest has many awesome beer gardens and outdoor eateries, some of which are pretty well hidden. 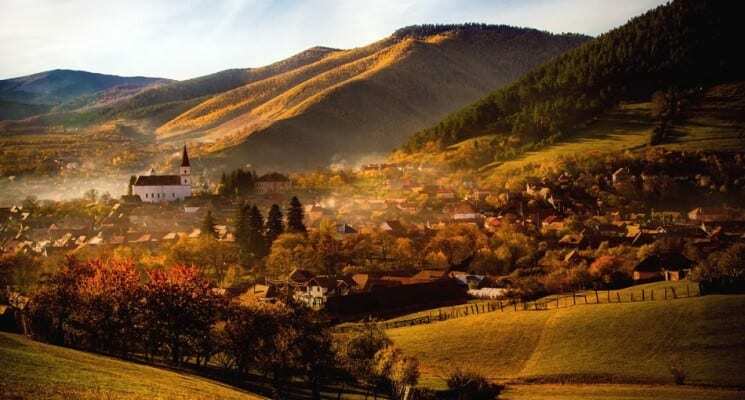 As previously mentioned, Romania is a pretty inexpensive destination as far as Europe goes, and the capital city is no exception. Eating and drinking out here won’t destroy your budget. Beer at a bar starts at about $1.25 a pint and a cheap, but delicious plate of food, starts at about $5.50. Bucharest also offers a nice variety of options when it comes to dining out. From traditional Romanian fare, to falafel/kebab, to continental European cuisine, to burgers and salads, and fabulous (if somewhat rare) instances of vegetarian and vegan food. 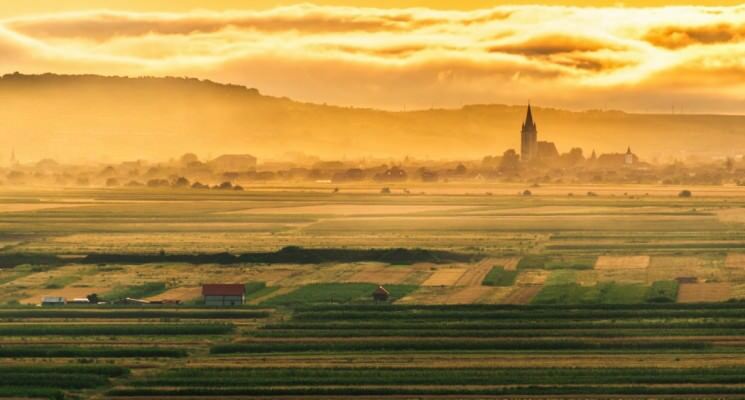 Romania has some of the best produce we’ve seen in all of our travels, and buying food to cook from the grocery store or market is extremely affordable. We were lucky enough to live a few minutes from a fabulous farmers market where we stocked up on ripe cherries and peaches, fragrant and sweet strawberries, local herbs and veggies on a daily basis. We even became friendly with a few of the stall owners and managed to communicate with a mix of sign language and broken Spanish and French to acquire their wares. Needless to say, you can always find something delicious and cheap to to fill your belly in Bucharest. 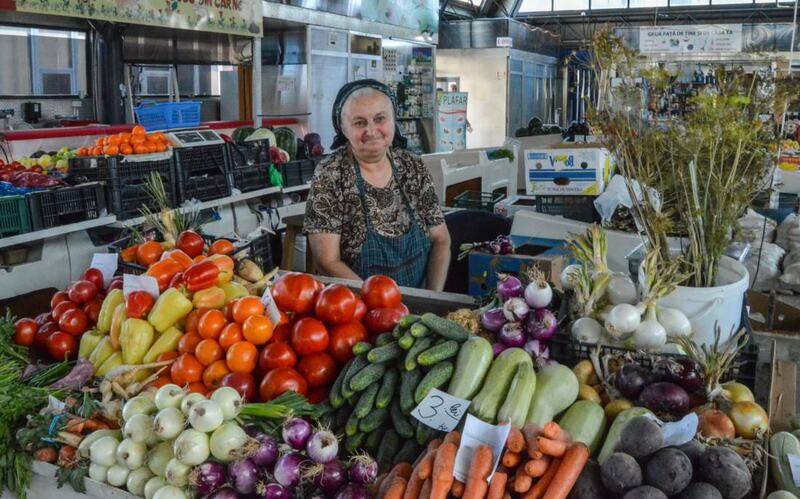 Bucharest, and Romania in general, is filled with amazing farmer’s markets. 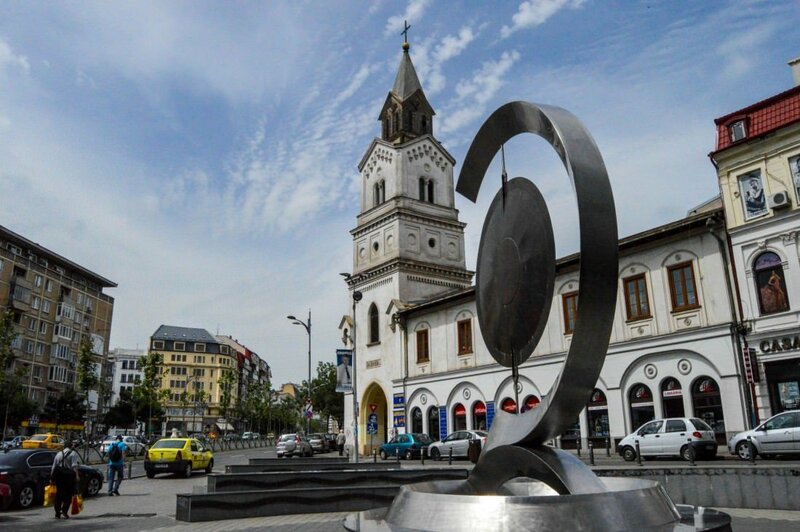 Getting to and around Bucharest is affordable and there is a wide variety of transportation options available. Taxis are cheap (like REALLY cheap) and public transportation is even cheaper. Once you reach the arrivals hall of Henri Coandă International Airport you will see three machines on your right hand side after the handrail ends (next to a flower stand). The screen has several taxi logos on it. Speed Taxi is your best option but if for some reason it isn’t available we also suggest Cristaxi, Cobalcescu, or Meridian. After you select a taxi company, the machine will print a ticket with your car’s ID (Idicativ Masina), the license plate number (numar de Inmatricular), and the estimated waiting time (Timp Estimat Sosire). Proceed to the outside of the building where you will wait for your car. Look for the taxi company name, the license plate number, and ID number (printed next to the back door of the car). 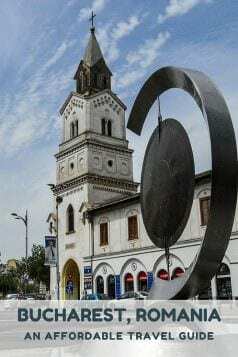 A trip to the center of Bucharest will cost your about 40 RON ($10.00 USD). We highly recommend downloading the Speed Taxi App for your phone. There are some taxis stands dotted around the city but the app is great when you want a taxi to come to you. Plus it’s free! If you’re planning on taking a train to or from Bucharest you can check prices and schedules on this website. A majority of Romanians are friendly and bilingual. A large percentage of Romanians below 40 years old can speak at least passable English. Likewise, a great deal of the folks over 40 years old speak a bit of French or Spanish. So, don’t be afraid to strike up a conversation. That said a good deal of cab drivers are over 40, so it’s best to enter a cab prepared to use the few Romanian words you might have memorized, or have the address of the destination you want to go to printed out or on your phone’s screen to show them. We found Bucharest to be an extremely safe city, especially in the vicinity of the Old Town. During the seven weeks we spent there we encountered zero crime, day or night. We never once felt threatened while walking around. Of course there are probably neighborhoods you want to avoid after a certain hour, but we highly doubt you would find yourself in them anyway. We have compiled a list of prices in Bucharest, current as of July 2015. We have included daily items such as groceries, the average costs of certain meals, costs of going out at night, and costs of transportation. We hope the list makes planning your trip to Romania’s capital city easier! Bucharest is an extremely affordable destination for just about any traveler. You can easily manage to spend under $20.00 a day if you budget yourself wisely, and for $70.00 a day you can find yourself enjoying fine meals, cold drinks, and pleasant hotels. 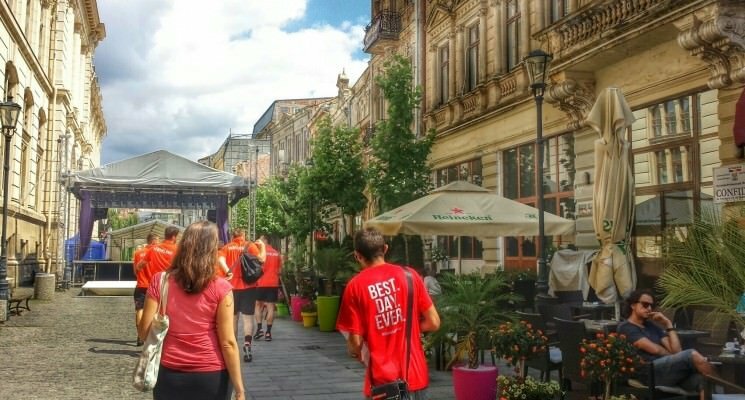 Backpackers in Bucharest can stretch their budget out pretty easily, making it an extremely attractive city destination for budget travelers in Europe. A note on budgeting yourself – Expenses for activities you might want to partake in should not be factored into your daily budget. This becomes overly complicated. An easier way of going about things is to calculate your minimum daily expense and then set aside all left over funds you care to spend into an “activities” pool. Thus on a day when we went to the movies, on a walking tour, or had a few extra drinks in the evening we did not consider ourselves over budget even though we spent a bit more, we just subtracted it out of the “activities” pool. 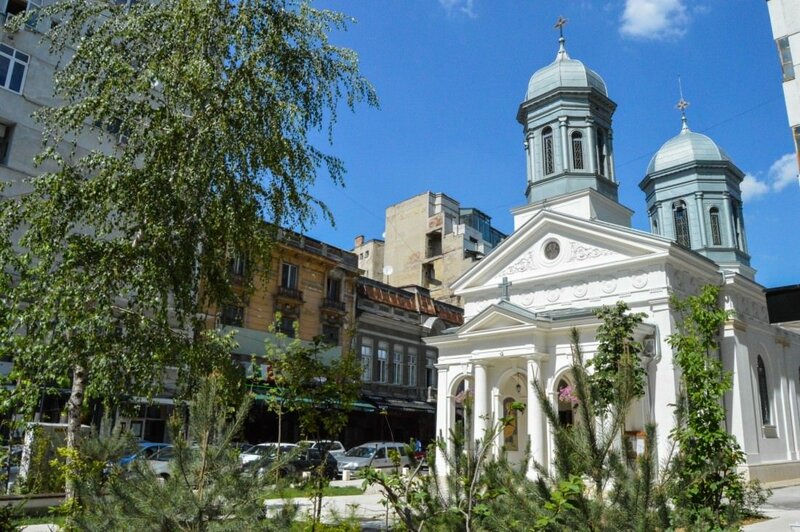 So there you have it guys, our guide to visiting Bucharest on a budget. We hope to have given you some ideas and inspiration for exploring this extremely interesting city on as little money as possible. As always happy travels, and we’ll see you on the road! 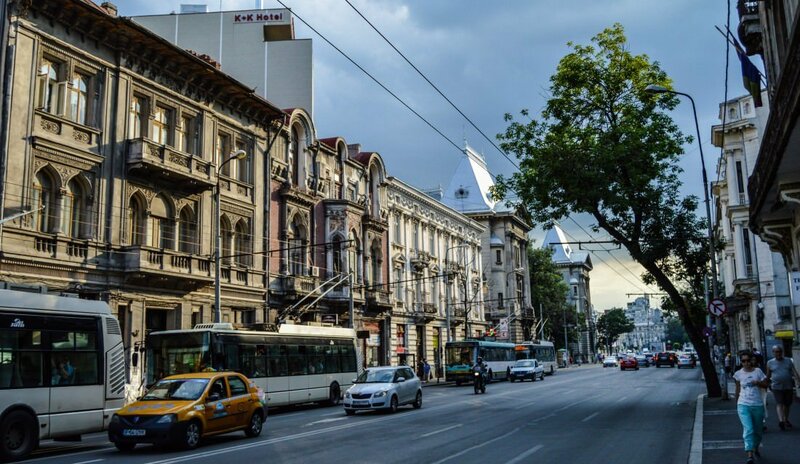 Nice article about Bucharest. There is always more to see. A rental car will help you discover Bucharest’s surroundings and many other beautiful places in Romania. I’d like to go there but I’m still hesitant about the language barrier and also traveling there as a POC. Great post though! Excelent job guys. 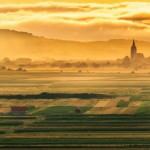 I love Romania.